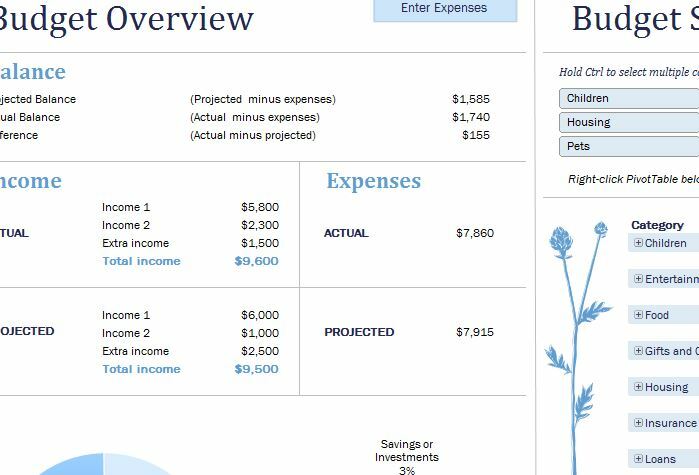 It’s time to whip those pesky finances into shape with the new Family Budget Workshop template. This document was designed with one goal in mind, to make your life simpler. This document has a free-flowing structure that makes organizing, listing, and analyzing your financial information easy and quick. You will simply enter your income and expenses, and then you will receive helpful feedback about your finances so you can adjust the way you use your money to finally start saving and step out from under the shadow of debt once and for all. If you’re ready to get started today, just follow the guide given below. Click the link at the bottom of this page to download. Now, skip the “Balance” section for now. You will first need to list out your income in the “Monthly Budget Report” tab. Then proceed to the “Monthly Expenses” tab below. As you have probably guessed, you will enter all your recurring expenses in the table of this page. Just follow along with examples. Each column has a separate item to list for your expense. Once you have completed your list of expenses, you can create a list of categories to make entering items much easier later on in the “Additional Information” tab. Now go to the “Monthly Budget Report” tab at the bottom of the page to see your financial overview. The right half of the page shows a breakdown of your expenses with graphs and the left shows you the same with a list of items. You can use this template to change your financial situation for the better by seeing where your money goes each month.